No need to compromise your beauty routine. Packing for a vacation can be stressful, especially if you want to keep up with your beauty regime. Instead of checking in an extra bag for all your products, travel smart and light with these compact and multi-purpose beauty essentials. From multi-use dry sheet masks and an airport security-approved cleansing balm to a multitasking face primer, here are 10 of the ultimate beauty must-haves to make packing for your next getaway a lot easier — without compromise. This unique dry face sheet mask is designed with a biomimetic delivery system, which means it prolongs the release of ingredients into your skin. With its built-in technological five Skin Solution IQ, it tailors those ingredients to your skin type, too. And best of all, this mask doesn't harbour bacteria because it's dry, so you can wear it up to three times. Wear it on the plane to save your skin from the cabin air and store the mask back in the packet until next time. 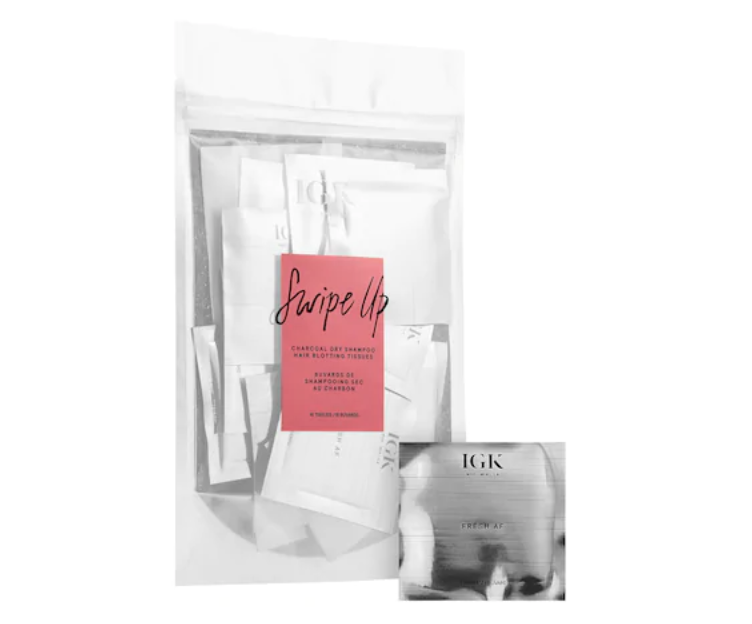 Leave your bottle of dry shampoo at home and pack these portable oil-absorbing dry shampoo hair blotting tissues to instantly freshen up sweaty roots and touch up styled hair. They're formulated with activated charcoal powder. Just press the coated side of the tissue onto oily roots or wherever needs quick absorption. A little goes a long way with this powerful sunscreen (seriously, it's no bigger than your lipstick). This is perfect for city travellers or adventurers who are always on-the-go and will no doubt need a sunscreen touch up. The pocket-sized, water-resistant sunscreen stick protects skin from harmful UVA and UVB rays for up to 80 minutes at a time. Infused with cocoa butter, non-nano zinc and California poppy, this product easily glides on without a white, heavy-feeling residue. This three-in-one face palette substitutes for your foundation, concealer and contouring products, ultimately leaving you with extra space in your makeup bag. Available in three colour ranges, each palette comes with six buildable and blendable shades to help you cover up blemishes and highlight your best features. Brush like a pro wherever you travel with this super techy electric toothbrush. The Genius 8000 is made with a visible pressure sensor to protect your gums from rough brushing and also connects to a smartphone app via Bluetooth technology that provides time coaching and real-time feedback about your brushing technique. But the real highlight is that the toothbrush comes with a Smart Travel case that charges your brush and your smartphone. Win! Suitable for all skin types, the nourishing formula of this multitasking face lotion is designed to shield the skin from broad spectrum UVA and UVB rays. Along with antioxidants to prevent dark spots and premature signs of aging, it is also formulated with mineral-rich nutrients to help prep the skin and hold makeup. In other words, it's the ultimate face primer. Forget packing five different shades of lipstick — this adorable pill-shaped nourishing lip balm is all you need. It goes on clear and then reacts with the skin's pH levels to create the perfect customized shade of pink. Compact yet powerful, this solid facial cleanser is packed with matcha green tea and lavender water to not only cleanse the skin, but also exfoliate and detoxify clogged pores. Designed for a jet-setter, it's vegan, CATSA-approved formula will help you get through airport security in zero time. Only a true beauty enthusiast knows how much time, effort and product go into creating Insta-worthy brows. 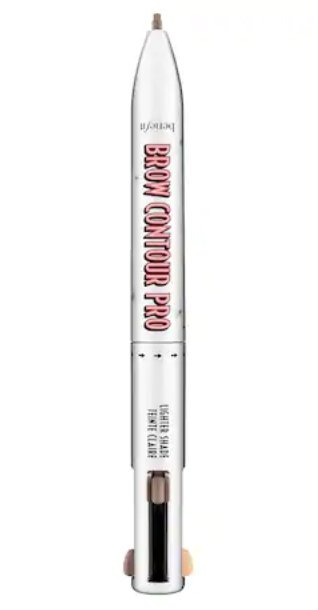 But instead of packing multiple products for one job, this multitasking, four-in-one defining and highlighting brow pencil is exactly what you need to keep your brows looking fresh and groomed all vacation long. With no rinsing or harsh rubbing required, instantly wipe away makeup, dirt, oil and sweat with these micellar cleansing towelettes. Infused with Australian cypress oil, they gently remove impurities while deeply cleansing and nourishing the skin.